I stumbled across a new-looking Sally Hansen Salon display last night and immediately this bottle caught my eye. I was marvelling over the beautiful multichromatic purple pearl color when I noticed the name. Uh oh. Sarah S., Sally Hansen already has a shade called Hidden Treasure. It's the most sought-after recent Sally Hansen Salon Manicure shade because it's a flake topcoat. But now that they've re-used the name, it may mean that they're not going to re-release the original Hidden Treasure, or at the very least, there will be lots of confusion due to two polishes with the same name. They should have called this "Hidden Pearl" or "Oyster Shell" or something else. Aside from the bottle it's in, there's no resemblance at all to the original. I don't like when companies do this. I agree. I heard Sally H. was re-releasing 'the' Hidden Treasure and to see this new version if it...is annoying and disappointing... They really should have hinted at the former with a similar but different name. Okay, this looks super awesome...but I hate when nail polish companies recycle names, especially when the older polish is rare and sought after gem to the nail art world! I saw this reviewed over on Nouveau Cheap, and was kind of annoyed. It looks a lot like Ring My Shell, and they're using the same name as that amazing flakie polish that they released?!?? Irritating. Hopefully others will pick up the ball, and release another really great flakie that's both multicolored/opalescent -=and=- inexpensive. Ehhh, there are tons of new flakies on the horizon, and Nubar's 2010 is pretty much exactly the same thing as Hidden Treasure (but cruelty-free). What *I'm* irritated about is that Zoya's site has a "PRE-ORDER NOW!" button for their new flakie collection....which takes you to a page that says they'll be available Jan 10. Do they not understand what "pre-order" and "now" mean? Uh-oh, indeed. Boo! on Sally Hansen for this one. I'm with Sarah S, there will be people jacking this up on eBay, and then when the buyer gets this, they won't have recourse because they were sent a bottle of Hidden Treasure. Good job, Sally Hansen. Not. How does this compare to Sally Hansen Angel wings? Looks similar. Total uh oh. I saw the title of your post and got all excited as I was clicking on it. Then I looked at the pictures without reading and was like... this looks wrong. Even if they called it "Hidden TreasureS," the plural would at least make it different (still confusing, but something) Ugh. Oh Sally, shame on you! How annoying. Of all of the names they could have used, they had to go with that one!? razy is that! SH had the best flakies,they were bigger and seemed greener..applied like butter too..Why reuse an iconic name?! That's so weird that they'd reuse the name for a totally different product! This reminds me a lot of a Sinful colors NP I have... forget the name but it's a similar base with a green duochrome that is so beautiful! I really like this color, but what is up with the name? We already have a Hidden Treasure that everyone knows, and hopefully loves! Gah it's the OPI my private jet cycle all over again!!!!! Looks like Sally has been taking lessons from Suzi. Sally Hansen, you are shooting yourself in the foot. Essie's Shine Of The Times is a dupe for the original Hidden Treasure. Boo on Sally Hansen for this. I keep picking this up but have yet to buy it. I was kind of confused the first time I saw the name - don't think it was smart of them to re-use the name. This literally made me laugh out loud. I remember when I first saw the original Hidden Treasure and all the missions my boyfriend went on to find it for me for my birthday. Sadly, I hope he never sees this or I will never hear the end of it!!! 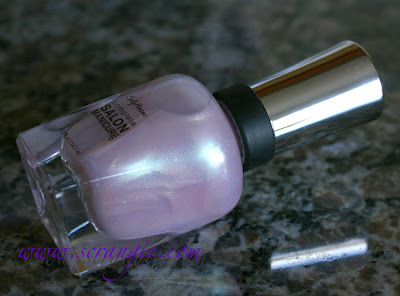 I would love to know what Sally Hansen was thinking... Good looking out!!!! I think this might be Ring My Shell renamed as Hidden Treasure? They were released in the summer same collection. It looks VERY similar to RMS. I kind of feel like, I'm not particularly upset by this. I definitely don't think it's a good idea for a company to release a new polish with an old name (especially such a popular old name...), but I'm not angry about it. Call me a heretic, but I never really liked the old Hidden Treasure anyway. I had it, wore it once, and swapped it almost a year ago and never looked back. Besides, now there are as many flaky options as there are crackle top coats, and at $8/bottle Sally Hansen isn't really any cheaper than most non-drugstore brands, so demand for the original Hidden Treasure is definitely decreasing. I bought the new Hidden Treasure and plan to use it later today! I'm disappointed with Sally Hansen. Who in their company thought it this was a good idea???? What were they thinking?? Also the color isn't THAT great, IMO. Nice, but not worth any confusion with the name. To quote Florence (a previous commenter) "They should have called this "Hidden Pearl" or "Oyster Shell" or something else. " I agree. That doesn't make much sense on SH's part, but that aside, the polish looks pretty awesome. 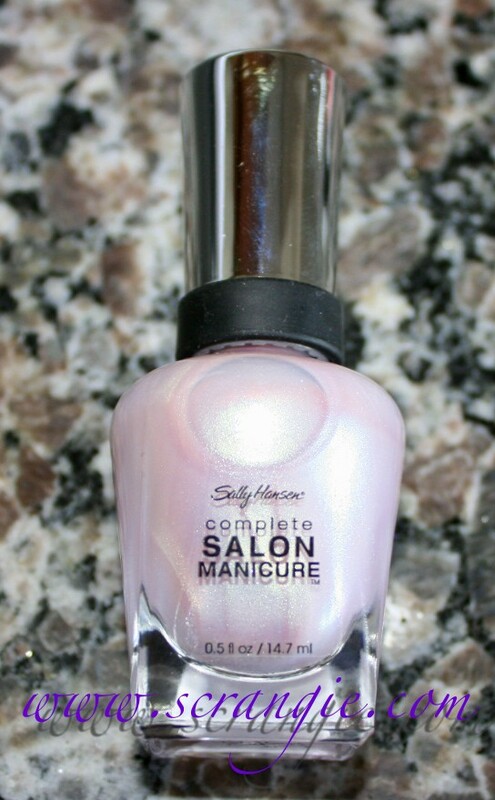 Contacted Coty, the parent company for Sally Hansen to get some clarification to see if this is a re-release, or simply a different polish with the same name unde the "salon" line..from memory the flakie ht was not a "salon manicure" was it? Note the polish named "Ring My Shell," it looks like they re-released and switched the labels or something! Uh oh is right. I was excited when I saw the title of this post, then I realized it's not the same Hidden Treasure. :( But I have Nubar 2010 which is just as good. Regardless, people are going to get confused. Thanks for the heads up. I haven't seen this one in the store yet. why would they do that!? This is going to confuse a lot of people looking for the original Hidden Treasure. When I posted on this, they contacted me three times, the final being that they liked the name so much that they decided to use it again but this time with a more exiciting and even more beautiful color. bwahahahahahaha. ok, whatever!!!! !